NHT 1259 has an in-line low pass passive crossover at around 100 Hz as in NHT 3.3. The satellite is about 2 ft away from the backwall and just sit on the boxes containing the sealed NHT 1259's. Does the JBL127h1 have a cut freq or is it allowed to roll off below a 100Hz? I have a very rough idea about the frequency responses measured in my room with the help of a Radioshack analog SPL meter and Stereophile test CD. The response cures will not be comparable to any other lab measurements. These curves are not calibrated and are meant to serve as a comparison purpose. The microphone is placed about 1 meter between the JBL woofer and tweeter. Keeping that in mind. It does appear that JBL 127H1 satellite without NTH 1259 begins to roll off below 200 hz. This is due to the very small sealed box volume , a 50 ohm resistor across woofer and the placement of the satellite without room boundary reinforcement. Combining with NHT 1259, the entire bass region (red and green lines) becomes flatter and extends at least to 32 Hz. As shown. Most of this thread has been about the speakers atop the stack so this post is a twist that focuses on the AR58s sub-woofer. 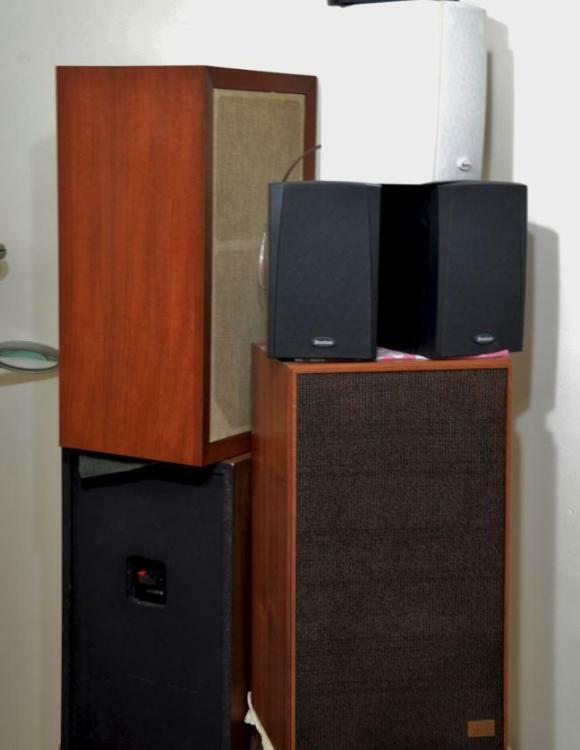 As you an see in the photos the 58s are raised 1ft above the floor but are also inverted, with woofer on top, and placed square against the wall within 2 to 3 inches of the woofer frame. Several position configurations were tried, following the Roy Allision research regarding woofer placement and this configuration yields the smoothest bass of all up to 200hz where the woofers are low passed. Mid bass peaks are gone and perceivable room resonances at the listening position have vanished. The curve for this position shows a rise, which is present, at the very lowest response range but I have yet to hear a recording where it is a problem. I also got lucky because the Allison study only predicts effects from first reflection from nearby surfaces and not additional walls as you would find in an actual listening room but it gives a good start. This post is about the AR1w but first I want to say something about the AR9. The only AR9 I have ever heard is the original vertical. The feature that always strikes me when listening is the bass output, but I don’t mean the depth or prominence. If the speakers are installed within the very liberal guidelines suggested by AR you are rewarded with automatic, practically flat bass to 200hz. The beauty of flat bass is, voices seem to float above the low frequencies with zero coloration introduced by bass peaks. I mention this because I now realize that any AR12 inch that employs a single front facing woofer is subject to coloration in the voice band because the woofer performance is almost always compromised in order to keep all the upper band drivers facing the listener. This may not be true in a lab but given the usual limitations of home listening spaces it is a general fact. In the case of the AR3a the best position to achieve optimal and practically flat bass performance is to mount them flush in a wall or book case. I can’t do this at my house. Thankfully, Roy Allison left a body of research that points to other ways of achieving practically flat bass response by using modern electronics and the AR1w. I was recently reminded by one of our forum experts that inside every AR3a is an AR1w. I purchased a long idle pair, restored them to life, disconnected the jumper and began testing them as alternatives to the AR58s as a passive subwoofer. I have included images, below, of the left and right channels. 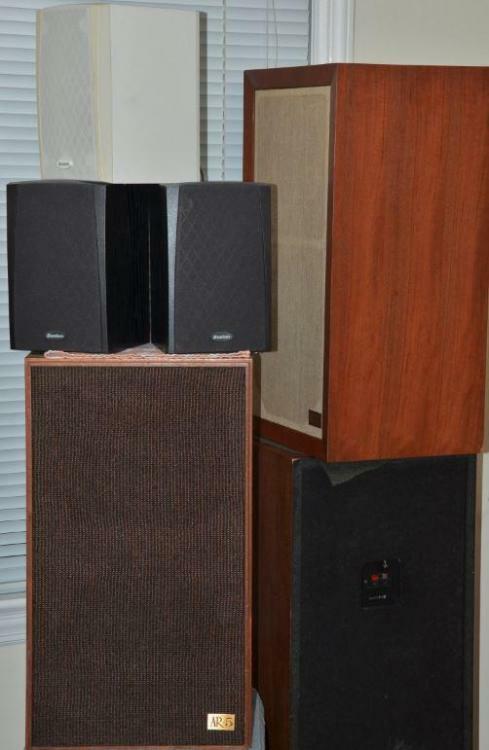 Using the 58s as stands places the 3a woofers 45” above the floor, almost equidistant between ceiling and floor. 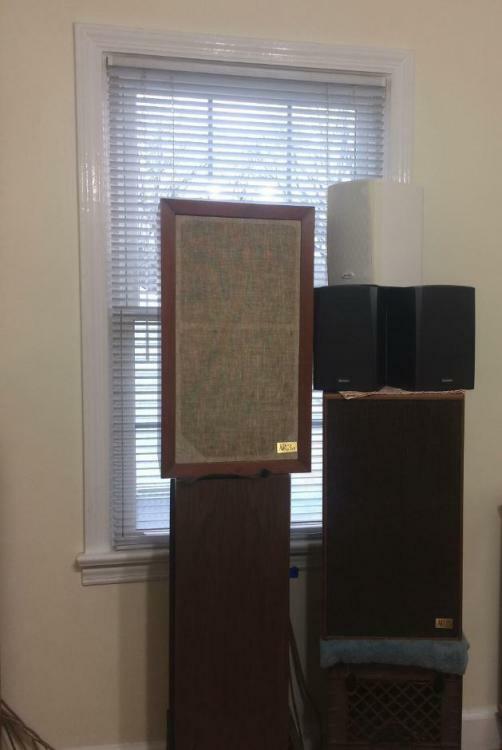 I originally had them installed with baffles against the wall, but the room gain caused an annoying peak in the 50hz range when playing some pop music with three note bass lines. The solution was what you see in photos and is a solution which I rejected when using the 58s woofers in the same position directly one foot lower on the wall. Room boundaries cause crazy phenomena with bass. The 3as have been turned to correspond with the fig 7 below of the Roy Allison paper. What I am experiencing now is almost like the voices floating over the bass that I hear with the AR9. What I thought were clear vocals before are even clearer now. The long term plan is for either the 58s for 3as to move to another room but while they are here I will have the tweeters rebuilt in these 3as, then biamp them alongside the AR5s with the 58s as bass units. The intent is to determine if the voice performance of the 3a can be made to mimic the AR5 by splitting the high woofer octaves from the low octaves. I couldn’t leave well enough alone. As I listened to this new speaker arrangement I kept running across occasional rock and pop vocal recordings that had an annoying peak in the sub 125hz range. I had been all over the gain controls and was convinced this was purely a question of positioning within this room. I finally moved one woofer about 2ft along the wall and reversed it to face the opposite corner which reduced the low bass peak but it sounded too lean. In desperation I decided to return to flat settings on the equalizers and recalibrate everything by pulling out the headphones and refreshing my memory of how this music sounds with zero room reflections. In the process I relearned what flat bass sounds like and this; that most of the pop and rock vocal music that I listen to does not have very deep or prominent bass. When set properly the bass almost never blurs the vocals nor is it so loud that the vocals are overwhelmed. In the end, all I needed was even milder equalizer adjustments to get very close to the headphone sound. I know this is subjective. If you like bass slam, listen to power chords and shredding guitars then you won’t be interested in what follows but, if you really want to hear all the words that are being sung, especially in classic rock and pop, then put on your headphones to adjust your system and get an easy improvement in both imaging and clarity. You need merely decent headphones and these songs. The original “Astral Weeks” by Van Morrison. This is almost all acoustic with subtle textures easily obscured by mid bass peaks. Morrison's vocals can be very difficult to understand on speakers but are completely intelligible on headphones. “Paradise by the dashboard lights”. Every lyric word as well as the baseball base stealing metaphor can be heard clearly through headphones. It is easy for the mid bass to obscure the male vocals in this one and blur the female voice. Other tough ones are "Born to Run" with the E Street Band and "What would you say" by The Dave Matthews Band. The change was so stark on some very familiar songs that I wasn’t sure I still had the low bass that I want when it exists in the recording. To reassure myself, I played some classical recordings that I know have low bass and all is well. If you can get your system to play these songs clearly then everything else will sound good. Your perception of bass may change.
" In the process I relearned what flat bass sounds like. In the end all I needed was even milder equalizer adjustments to get very close to the headphone sound. What I learned was most of the pop and rock vocal music that I listen to does not have very deep or prominent bass. When set properly the bass almost never blurs the vocals nor is it so loud that the vocals are overwhelmed . Original “Won’t get fooled again” by The Who. You can hear every word on headphones. The bass line is surprisingly not prominent on headphones but through 12” ARs it is easy to have heavy mid bass that blurs the vocals"
Well said! Here is an in-room frequency response of NHT 3.3 . Some people describes it sounds like a pair of headphones and it has excellent vocal clarity. The vocals from 100 hz and up come from the front drivers while the bass from the side mounted 12" woofer(also know as NHT 1259). My interests in 92 db satellite speaker and passive stereo subwoofers with 100 hz crossover were inspired by NHT 3.3. It is a journey with no definitive answer. What would you say if you were a doggie on chain? Chumps like us, maybe we were born to run. I used to be a research scientist so I am used to pursue a goal for a long time with occasional breakthroughs. As long as we are learning something new and still having fun then we ought to keep going. This is a comparison of a refurbished AR3a vs AR5. It is a mod and tweak topic because both speaker systems are bi-amped with a common bass system provided by an AR58 crossed over at 200hz. Except for impedance both systems have identical dome mids and are crossed over from mid to woofer at around 500hz for the 3a and 600hz for the AR5. The AR5 has original Compulytics while the AR3a has all new NPEs in place of the original ICC wax caps. Both speaker models have rebuilt Chris tweeters. Tweeter and mid controls were set very close to identical. Both systems were sitting adjacent at a listening distance that varied between 5 and 7 feet and volume matched within 2 seconds after the switch. You ask, “What is he up to now?” Answer: To find out if an AR3a can be made to mimic the sound of an AR5 on human voices. Short version: An AR3a can sound virtually identical to an AR5 in rendering human voice, which is contrary to many opinions expressed over many years on the CSP. You can Google it. It also occurs to me that if you are mounting your AR-3a on a stand or table (above the floor but back against the front wall), your AR-3a will be susceptible to the "Allison Effect," a boundary-caused dip of several dB as the reflection from the wall behind the speaker (and the floor) interact with the direct output of the woofer and cancel (null) certain frequencies to some degree, usually around 300 Hz or so. This could impact intelligibility at those frequencies, of course, and the way to fix this problem is to mount the AR-3a flush with the wall or in a bookcase flush with books around the speaker so that the woofer sees a true 180 solid angle. It's not always easy to do it that way! With the AR9, the idea was to get the woofers to operate close to the floor-wall boundary to get maximum reinforcement and minimum boundary dip, such as the wall and floor, and to limit the pass band of the woofers for smoothest response. Therefore, with side-mounted 12-inch woofers operating up to 200 Hz, there had to be a lower midrange driver (requiring a 4-way configuration) to handle the mid-bass frequencies. This also allowed a higher crossover into the 1½-inch midrange dome to improve its power-handling capability, and so forth in the design of the AR9. It was definitely a step forward in design. 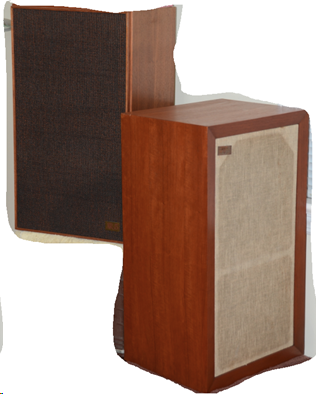 The AR-3a has been criticized in the past for its somewhat "heavy" sound, and some of that problem was due to a crossover issue during the changeover from the Alnico woofer to the newer ferrite woofer in the 1969-1970 time frame. Also, the relative balance of the midrange output to that of the woofer seems to give a slight sense of heaviness, but it is very minor. 1.Remove bass peaks below 200hz. Not easy to do with a 3a unless you mount it flush in a wall or book case. The last octave of bass must be flat or rolled off as perceived at the listening position. This is not a problem with the 5 because it does not naturally yield much of the last octave unless forced. If you place either speaker in a position to emphasize the lowest frequencies using room gain you will probably introduce peaks that interfere with the perception of voice, but the effect is much worse with a 12 inch woofer. My solution was to make both systems use the same bass sub-system which I have already optimized for this listening area. The 3a woofer is rolled off 24db octave below 200hz. 2. Tweeters aren’t required to render a clear voice but once the bass is worked out voices will sound dull without tweeters that work well. For either of these systems that means rebuilt or HiVi. Even if they pass the paper roll tube test, I promise you, your UNrefurbished, 50 year old, ¾” AR domes are defective. 3. Asking a speaker to render Louis Armstrong, Ella Fitzgerald, Sarah Vaughn etc. is not a challenge. The mixes were set up to make the voice the prominent feature. A real challenge is to play some of the following and understand the vocals. -Cowboy Junkies- "New Dawn Coming"
All these songs have lyrics that are clearly understandable on well sorted systems. You don’t have to like the music but if you can’t hear the words in these songs on your speakers you are missing a lot of musical detail in the recordings you do like. In my comparison the 3a easily matched the vocals in both timbre and clarity to level of the AR5. Bass interferes with imaging. Remove the bass as a problem and imaging blooms. The 3a and the 5 were conceived in the days before imaging was a feature but don’t believe it if someone tells you they can’t image. They can be amazing. The AR5a is no more. The AR58s subwoofer has been replaced by an unjumpered AR3a making the new system an AR-51W. In the subwoofer role, there was no perceivable qualitative difference so the combos were chosen based on wood grain. The 58s is now mated to another 3a to become an AR-358, to be operational after a tweeter rebuild. This one will be used to compare the sound to an AR9. This is NOT about winners and losers but differences. This post is about a tweak that will work for any Classic AR with pots and not about the mod configurations that dominate this thread. I forgot to mention one big impediment, IMO, to making a properly working AR3a or AR5 produce a good image. The tweeter and especially the mid output must be virtually identical across the stereo pair. There is so much variation in pots that you cannot do this visually, it must be done by ear and it is not easy with one person doing everything. I only noticed this recently when I made a change in the Satstack that produced a discernible leap in its imaging and which materially separated it from the AR5. The Stack was suddenly razor sharp by comparison and I was not happy that the 5s were a little off balance. The solution was to adjust the mid controls until the drivers produced the same output level. Until recently I thought “close” was good enough but it is necessary, for imaging purposes, to dial them in exactly. I am speculating here but I suspect the dome mid control variation may be a big reason why the 2ax has a better imaging rep than the classic domes. The first 5.5 octaves of music are covered by the 2ax woofer whereas the domed systems barely cover 4 octaves in the woofer before crossing to the mid which may or may not be set correctly according to pot condition and listener care. Conclusion: Classic dome ARs are fit to excel at imaging but they require more attention because of pots or even Lpads. Status update: The AR 358s is still in the pipe awaiting tweeters, which are inbound.